The Camperbug Lancashire county listing has vans in locations as far flung as Preston, Barrow in Furness and Bolton. Our owners list their vws for hire to visitors to the Camperbug website and can be picked up from locations including Lancaster and Warrington. I am Tracy, hire me today! The van is called Tracy and it’s a Ford Transit Custom Limited , it’s a brand new conversion and the interior units are in altofina green. It sleeps up to 4 people. Full profesional conversion to a very high standard completed in 2018. Full insulated with Altro flooring, double swivel seat with 2nd table , mains hook up, 27litre water tank . Easy erect side awning with no poles . Nissan Elgrand, why not to try something different ? Enjoy the ride with our one and only Japanese 4x4 adventure car with automatic transmission which offers luxury accommodation for two but with its size you can still park up anywhere in regular car park. 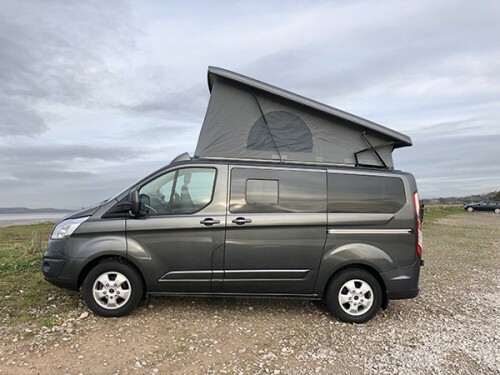 Candy is a modern take on a campervan conversion, she is fitted with everything you need to make your next adventure great. She sleeps 4 and has a shower & toilet, gas hob & oven, microwave, tv, mood lighting, awning, outside BBQ has point.